Discussion in 'General' started by von Poop, Feb 11, 2019. WW2F recently re-raised the topic of the two US chaps killed in a 2015 M18 explosion. It's got me wondering about WW2 accident rates. We have a fair few threads on specific accidents (eg. : Accidental Deaths WW2 ), but I don't recall ever reading much on just how many in total were lost to accidents, or just how common they were. Air losses are perhaps the most commonly mentioned, and there's things like the Conger mine explosion, Fauld etc., & I've certainly seen a bit on people lost to blackout accidents, but it mostly pops up in passing, 'there was an incident involving' stuff. The day to day attrition of millions working in rough conditions among heavy machinery & weapons has to have been substantial. The wartime blackout, when regulations required streetlights to be turned off and traffic signals and headlights to be dimmed, led to a dramatic increase in road casualties. The King’s surgeon, writing in the British Medical Journal in 1939, complained that by “frightening the nation into blackout regulations, the Luftwaffe was able to kill 600 British citizens a month without ever taking to the air”. The number of deaths peaked in 1940 at 9,169. One person died that year for every 200 vehicles on the road; today the figure is one for every 20,000. A few military I have researched so far in the UK have been illness via the DC. Killed when hit by a bus in the blackout cycling to report for duty. Killed in a fall from a wall trying to extinguish a light during an air raid. Fatally injured in an accident whilst travelling on the prison van. Tricky Dicky, Slipdigit and smdarby like this. I am glad to say that the number of accidents reported in March in which Army vehicles were involved was 19 per cent. less than those reported in February, and the figures for April show a further reduction of 12 per cent. on those for March. In this connection the House may like to know the results of a recent census and analysis of the fatal accidents in which War Department vehicles have been concerned in the first three months of 1941. During this period a total of 2,264 persons were killed in traffic accidents throughout Great Britain, and of these 2,137 were civilians. The number of civilians killed as a result of an accident in which a War Department vehicle was in any way concerned was less than 6 per cent. of this total and the number of cases in which an Army driver was to blame was just under 2 per cent. That is to say about 40 civilians were killed as a result of negligence by soldiers. The number of soldiers who were killed on the roads during the same period was 129, and, of these, 52 were killed as a result of the negligence of another soldier. I hope that these figures will help to remove certain misconceptions which have arisen with regard to the extent to which Army vehicles are responsible for casualties on the roads. But I would not like the House to think that the position is regarded with complacency by my Department, and I1056can assure them that the problem of securing a further reduction in the accident figures will continue to be pursued with the utmost vigour. Tricky Dicky, Slipdigit, Roy Martin and 1 other person like this. Tricky Dicky and Roy Martin like this. Five BEF motorcyclists died due to head injuries prior to mid-October 1939 and they had only been in France a little over a month. timuk, Tricky Dicky, von Poop and 1 other person like this. Tricky Dicky, Tolbooth, CL1 and 1 other person like this. During World War II every 5th notification of the death of a member of the United States Army sent to American families was caused by nonbattle trauma, and every 20th was due to disease. In the past the problem of disease was more important than that of nonbattle trauma, but due to modern advances in prevention and treatment of infections there has been a relative change in position especially when mortality is used as the index. The effect of epidemics of infectious disease which rendered whole armies ineffective has been well documented in history. The relative importance of mortality from disease and nonbattle trauma in wars in which the United States has participated, and for which data are available, is presented in Chart 1. Along with the persistent thought of all the armies essentially living rough for weeks on end, which quite possibly feeds the disease & infection side, maybe another slightly Cinderella subject. Pre-war for the US , but still quite the list of accidental death, even in a peacetime army: Not read the whole thing yet, but that can only increase exponentially in the massive force to come. Slipdigit and CL1 like this. On 10th July there was an accident at one of the gun pits. the Gun was sited covering a road block and bridge on the main road through the village. Whilst carrying out Gun drills the firing mechanism was engaged before the breech was properly closed. The charge came back out of the breech striking Gunner Williams in the stomach killing him, and burning and blinding two others; two more suffered minor cuts and burns and suffered from shock. The shell on low trajectory passed through the village, amazingly striking the house that Gunner Williams was billet in. Might be Drill rounds not available and with invasion thought imminent and 6 pounders only just taken on strength it was essential to carry out drills. Tricky Dicky, Tolbooth, Slipdigit and 2 others like this. Tricky Dicky and von Poop like this. Cause of death: Killed rock climbing. Tricky Dicky, CL1, dbf and 1 other person like this. Tricky Dicky, Tolbooth and von Poop like this. Tricky Dicky, canuck and CL1 like this. From my research of the local Newark area many RTC fatalities not surprising due to the Great North Road and Fosseway passing through town. Early on it was person v vehicles during the new blackout conditions. Many service casualties in cars or on motorcycles at night usually after an evening in the pub. RAF and Army dispatch riders , young lads as delivery boys being knocked off push bikes by army vehicles. Falls from buildings , lorries , fire tender and RAF bowsers. Falling or swimming in the Trent river or canal. Accidental shootings at least 3 , 1 at changing guard and 2 in training. Accidental gassing from heating systems in billets. More unusual ones being a child being killed by a training mortar his dad bought from a mate , RAF man having a hangar door fall on him and a soldier killed after slipping at the swimming baths. Add to this numerous suicides and deaths from the normal pre antibiotic days of Meningitis and TB. ozzy16, Tricky Dicky, papiermache and 1 other person like this. Men from my Dad's regiment. Accidents are separated into "aircraft" and "non-aircraft," since the Air Force was part of the Army at that time. Unfortunately, accidental deaths do not appear to be further separated by cause (firearms, vehicle, etc.) Or, if they are, I could not find the numbers. 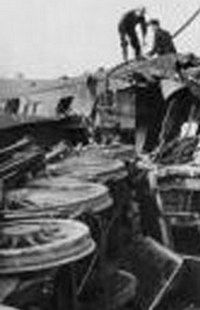 Bethnal Green underground tragedy March 3rd 1943: As a result of people thinking they were under air attack someone slipped on the lower staircase leading underground. As a result 173 people suffocated in minutes. The greatest loss of civilian lives in London during WW2. Image: Original newspaper report march 5th 1943 - with incorrect number of casualties. The location of the incident was not identified in the report. ramacal and von Poop like this. BARKING (RIPPLESIDE) CEMETERY, Sec. H. Grave 1671.